Students will hear the abbreviation PTSD and probably know its designation, post-traumatic stress disorder. Ask students to find out its causes. Where is it especially prevalent? How common is PTSD in everyday life where you teach? If you have ever been attacked and mugged on the street, or know someone who has, PTSD may occur after that attack. Or some other shocking personal experience. Doctors will prescribe medication that can help a person to cope with the nightmare. But it may be just that, a nightmare you experience. You replay the scene in your mind again and again. Among children and young adults living there normal lives, PTSD is extremely common in zones of warfare like Syria and Afghanistan, and under the Israeli blockade of the population of Gaza. Many who serve in military operations, in the American army and other defense forces, suffer afterward from PTSD. So one can talk about the ‘politics of stress’ in our world so full of unrest and oppression. Many who suffer from bullying because of their sexual identity, religion, ethnic background, also experience stress. In their case it may not be PTSD, but CTSD (Continuous TCD). Some spouses in married couples also experience CTSD, as learners may have observed. Another factor driving stress that is highly political is the employment of drones, for example, today in Afghanistan and NE Pakistan, largely by the US military. Ask students to figure out what that is, part of the ‘sociopolitical topography of stress’. Most of us do not live in some place where deadly small pilotless airplanes appear regularly, targeting someone on the ground (and maybe accidentally you or a loved one). This very recent video is titled ‘Living Benweath the Drones’ http://video.aljazeera.com/channels/eng/videos/featured-documentary—living-beneath-the-drones/4372086076001 It tells a very striking story of the psychological and physical impact of living beneath the threat of drone warfare in Afghanistan, leaving “catastrophic mental scars of war,” generating a sense of terror in everyday life for simple people. At min. 3:50 in the film you meet a former Afghan cook, Sadiqula, who was hit by a US drone strike ‘accidentally’ while working at his job in a hotel. It is very impressive as a brief report. This is ‘drone-induced stress’, including the ‘mental anguish of drones flying over your home’, a phenomenon of our turbulent times. Listen to the doctor discussing drone-PTSD and his many patients (from min. 12:15). ‘The silent threat from above’. How do students see such things perhaps far from their own lives? Most students in Europe, North America, Japan, China and 150+ other countries do not live under such stress levels in everyday life driven by modes of recurrent and endemic violence. So stress has a ‘social geography.’ Students should try to imagine the ‘social geography of stress’, even in their own countries. In my own home town of Chicago, there is a clear ‘urban social geography’ of stress – it is much greater in certain neighborhoods plagued by street gang warfare than in other parts of the city. Imagine living in a neighborhood where children can be shot playing in front of their house, accidentally caught up in gang war crossfire. If you think teachers don’t experience stress, explore this article: http://www.timesofmalta.com/articles/view/20130412/life-features/41-of-uk-teachers-experiencing-high-levels-of-stress.465262 It claims 41% of UK teachers facing high levels of stress. What kinds of stress do you as teachers experience? 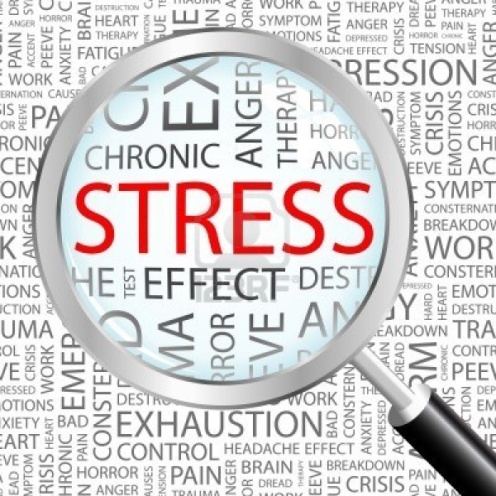 Are students aware of ‘teacher stress’? This also a useful general article, more medical in orientation: https://medlineplus.gov/magazine/issues/winter09/articles/winter09pg10-14.html Any human can experience stress. Also many of our fellow animals. Students can provide examples. Students can be asked: what is the difference between stress produced by examinations, heavy load at work, Christmas shopping, writing assignments, using social media, life with demanding parents —, and stress generated by the rising worldwide ‘epidemic’ of PTSD for many kids, their parents and families. Certainly relevant in terms of Gender Issues and more generally, and also a day that could be marked on this calendar. The article linked above is basic.